The eFlash 4000 is an autobooting Zorro III card with 1MB (two 4Mbit MXIC Flash memory 29FMX400 chips) or 2MB (two 8Mbit MXIC Flash memory 29FMX800 chips) of FlashROM memory with extremely fast 32-bit long word access. It allows any resident capable programs, libraries or devices to be executed immediately after booting up, allow services to be available immediately which would otherwise require a reboot. For example, it allows the PCI cards installed in Mediator-equipped A3000 and A4000 computers to be initialised, before the operating system starts. As a result, the computer may be booted from mass storage devices connected through various PCI controllers such as the Spider or Spider II USB cards. 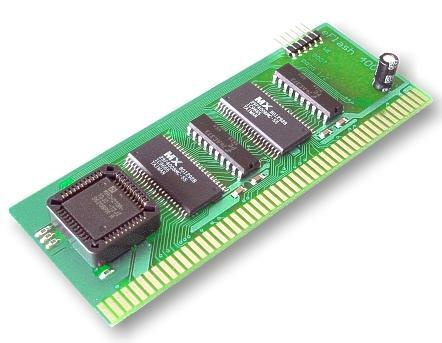 The FlashROM memory installed on the eFlash 4000 allows at least 100,000 erase and programming cycles. The card is provided with hardware protection against unwanted or accidental reprogramming and a hardware switch for selecting the start address of alternative programs stored in the eFlash 4000 memory. The card can be disabled if required by simply setting a jumper.